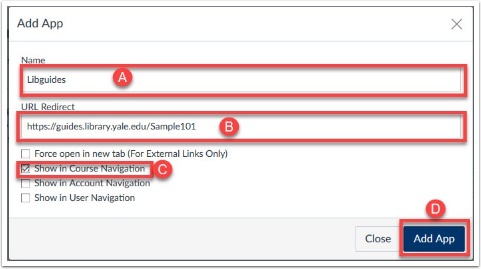 This article describes how to add LibGuides to specific courses and how to add the link to the course navigation. For questions regarding LibGuides, please contact Steve Wieda steven.wieda@yale.edu. For questions regarding the process within Canvas, please contact canvas@yale.edu. 1. Enter Coursesite that you will be adding the LibGuide, and click on "Settings" link in the course navigation. 2. In the settings area, click the "Apps" tab. 3. In the "Filter by name" search bar on the Apps page, type in the word "Redirect". The App options will filter as you type. 4. 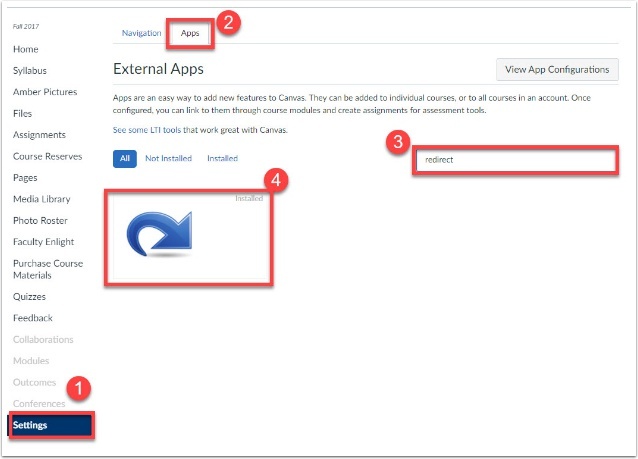 Click on the Redirect tool (large blue arrow icon) and then click the "Add App" button [A]. [A] Name - This is the text that will appear in the course navigation for students to click on. [B] URL Redirect - This is the URL for the LibGuide. [C] Select the checkbox for “Show in Course Navigation”. [D] Click the “Add App” button. 6. After you added the link, you will see a quick notification at the top of the page. 7. Refresh your browser (or just click on the "Home" link for the course) and you will see the new link in the course navigation.